Hoping that humor and sarcasm can get me through this thing they call motherhood. Whew! It's January, finally! The holidays this year were a blur of yarn and activity. The majority of November and December saw my kitchen counter piled with an assortment of wooly, cashmere goodness and my newest obsession; bulky baby alpaca. Knitcessity on etsy has the most gorgeous colors available for a really reasonable price! Last year we went on vacation just before Christmas, so the whole season felt condensed and we only got to enjoy our tree for about a week. 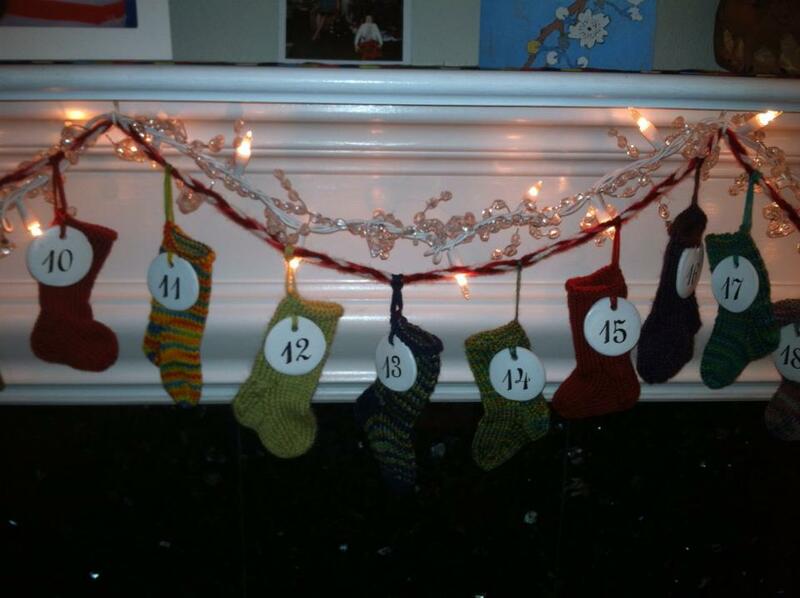 This year, I was determined to have everything up in the first part of December. Such a good intention. My mom came to watch the kids for me and commented 'Your neighbors must hate you. Nice pumpkins on the porch Sally Henny Penny, did you notice everyone else has their Christmas lights up?' Did you notice I don't care? Oh wait, but I do. So the next day I hauled the garbage can over and evicted my pumpkins and gourds and placed a lovely winter wreath on the door and cedar and holly on the mantle. I was even on the ball enough that I'd ordered hooks for our mantle for the stockings the month before but then realized...oh yes, stockings. I have three kids now, not just two. So, I pulled out the strips of fabric mid-December and whipped out another (really two more, because I accidentally made two of the same side) quilted stocking. They still don't have names on them, but I wouldn't want to leave myself with nothing to do next year, now would I? (Note my sad poinsettia on the left-of course I didn't think to water it) I also finally got around to sewing the fabric storybook for Jack that I bought before he was born, but it's good I waited because it was slim pickin's for Jack under the tree. Slouchy newsboy in grey 100% cashmere upcycled from a sweater. I love using upcycled cashmere as it usually results in a garment that has that velvety feel of your favorite pair of jeans. At the same time, I had a friend contact me about creating an advent calendar for her out of mini stockings similar to those found at Garnet Hill. Again, it was something I hadn't done before, so I was really nervous that what I created would not match their vision since I didn't have a concrete example of a prior work. I found a baby sock pattern and gathered a bunch of yummy cashmere and wool sock yarn and started knitting. And knitting. And knitting. At about forty-five minutes per stocking, plus the time to affix cute clay disc numbers I found on etsy it was definitely a big time investment so I was so happy when she got her package in the mail (on December 1st, naturally) and texted me that it was exactly what she wanted. Of course, I didn't take the time to photograph it, but here it is on her mantle...so cute! The last day of school for the big boys was December 18th, and I had planned to make a cowl for H's teacher and Charlie's teachers plus the director of his preschool. H's teacher had clicked through my email signature to my etsy shop earlier in the year and purchased a cowl for one of the other first grade teachers and commented that she loved them, so I filed that away. Filed it away until December 17th to be exact, when I pulled out my yarn and cast on. I made her cowl that evening and then gave Charlie's teachers a 'voucher' for a cowl in the color of their choice. 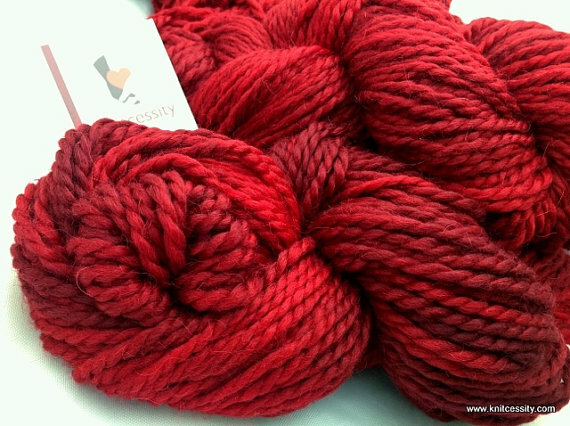 They both picked red, so they'll be getting a bit of knit goodness in the lovely color featured above. I've found several fun cowl patterns on ravelry for bulky yarn, but still love the Pepperberry Poppy (which I've blogged about here). I am going to knit the infinity version of it for myself...someday. For H's teacher, I chose the pattern I used for the Ramona (in the post above as well) but in super bulky yarn, so only one repeat of the pattern instead of three. I dub thee The Grape Gatsby. Lastly, the Caret+Chevron socks that I posted about when I started them. In a fun little circle of events, my sister-in-laws mother contacted me when I posted about them on facebook asking if she could buy them once they were finished-but no rush. I told her I'd be happy to, and got some measurements so they'd be a great fit. Coincidentally, I'd been thinking of making them for my sister-in-law as I've been planning to make a pair of socks for each of them for awhile. Within the week, my sister-in-law emailed me asking if she could buy them for her mom for Christmas; I love when something is just meant to be. But then I had to completely avoid talking to her mom about the socks, refrain from posting progress pictures of facebook (huge for my woefully oversharing self) or even talking about them. All the while I was afraid her mom would think I was a huge flake who just forgot about them. I'm really happy with how they turned out, even though I frogged back several times to get the heel to look good. The handpainted yarn from Sitting Tree was so wonderful to work with! And in case that wasn't enough crafting for a couple of weeks, I bought a kit for the most divine lap quilt. It's English paper piecing and will be super tedious, but the fabric is amazing and the chevron pattern sucked me in. Stay tuned for that one, because it's gonna take a long time to finish so there will be several posts along the way. Did you make any gifts for the holidays this year? Any gifts you're currently working on? Something amazing for yourself?